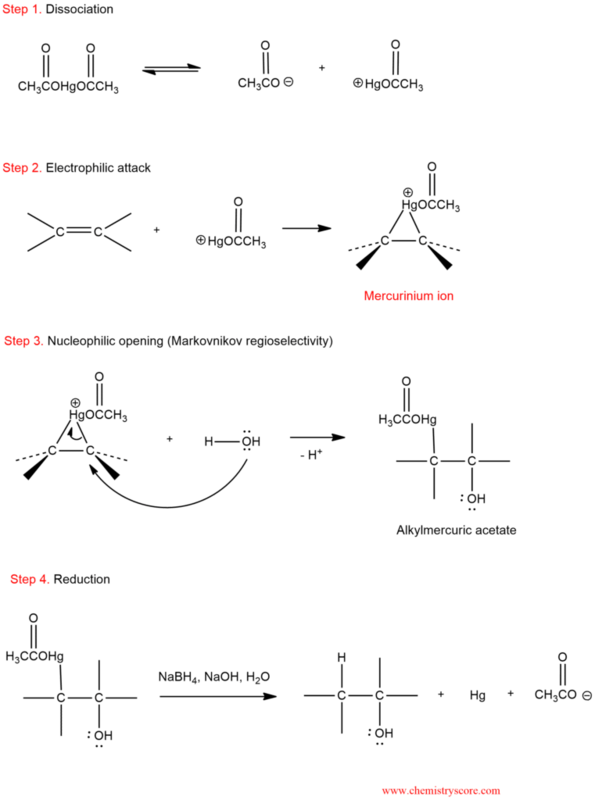 Oxymercuration-demercuration is the reaction sequence in which mercuric acetate acts as the reagent. In the first step (oxymercuration), treatment of an alkene with this species in the presence of water leads to the corresponding addition product. In the second step (demercuration), the mercury-containing substituent is replaced by hydrogen through treatment with sodium borohydride in a base. The net result is hydration of double bond to give an alcohol. The mercuric cation is a powerful electrophile and is subject to attack by a nucleophile, such as the π bond of an alkene. When a π bond attacks mercuric cation electrons interact with the nearby positive charge to form a bridge. This intermediate is called mercurinium ion. The mercurinium ion is subject to attack by a nucleophile which takes place at the more substituted position, ultimately leading to Markovnikov addition. After an attack of the nucleophile, the mercury can be removed through a process called demercuration, which can be accomplished with sodium borohydride. There is much evidence that demercuration occurs via a radical process. Oxymercuration-demercuration is similar to hydrogenation of alkenes because the same product is obtained. The only difference is in the transient state. In hydrogenation, hydrogen is simultaneously added to the double bond of an alkene by forming an intermediate – carbocation, which is subject to rearrangement. This produces a mixture of products. In this method carbocation are not involved; therefore, rearrangements do not occur.